Tech tools related to the International Space Station ruled NASA's Space Apps Challenge this year. New spot-the-space-station programs, software to use 3D printing in space and apps to help astronauts take pictures of their home planet were among the technologies to come out of the 2013 contest. 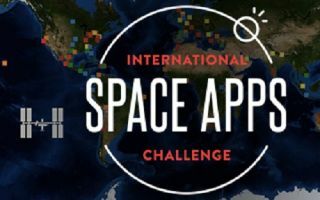 The two-day space apps challenge was an international hackathon of sorts, soliciting mobile apps and technologies to aid space exploration and enrich life on Earth. More than 9,000 people from 83 cities around the world contributed to the 770 entries submitted between April 20 and 21, according to NASA. Space Apps Challenge 2013 Participants in Nairobi, Kenya are seen here in this NASA image. Viewers on the ground can spot the orbiting lab moving across the sky and the Spot the Station challenge was aimed at building an app to allow users to share their sightings with others and create a visualization with the data. Software to help compare microbial communities on Earth with ones on the space station was developed in another challenge, SciStarter Citizen Science. The International Print Station challenge, meanwhile, tasked techies to create a 3-D printing model for use in space. T-10: This London-based prototype app is designed for astronauts living on the International Space Station who are trying to photograph specific spots on Earth. The program would take advantage of local weather data to alert spaceflyers when they are approaching an ideal window to snap pictures of those areas of the planet. Space Apps Challenge 2013 participants at NASA's Kennedy Space Center in Cape Canaveral, Fla., are seen here during the tech competition. ISS Base Station: The ISS Base Station, made in Philadelphia, combines hardware and software to spot the orbiting lab from Earth. It includes an app that tracks the position of the International Space Station, with a mechanical arm that can point to the current location of the lab and alert users when it's in view. NASA in Our House: This interactive website made by a team in Allen Park, Mich., allows users to read about some of the incredible benefits that the International Space Station is delivering back to Earth. Spot the Station AUT: This Auckland, New Zealand-made mobile app allows users to track the location of the space station and share photos and comments with other users. The app also featured a compass and directional indications overlaid on a real-time view from the camera. Augmented Reality International Space Station: Submitted from Santa Cruz, Calif., this augmented reality app for Android to allow users to spot the station by using a smartphone camera.